In the six months I’ve bought several replacement beauty items for the third if not fourth time and it occurred to me that in both instances these are products I won’t can’t be without. I figured this was a good rationale for a blog post, right? 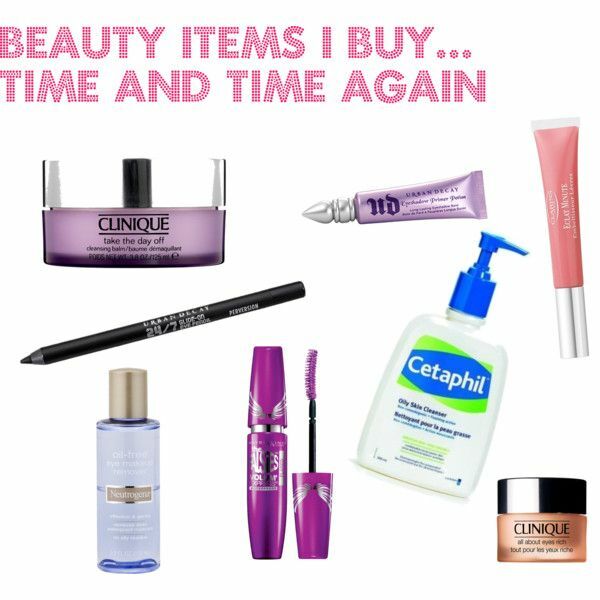 Here’s the beauty items I buy… Time and time again – and will continue to do so! Urban Decay Primer Potion: This is the McDaddy of eyeshadow primer and I’ve raved about this before. I keep this in my stash for special occasions and apply this before my eyeshadow: The result is intense eyeshadow colour pay-off and eyeshadow that does NOT budge. For day-to-day use I now favour Art Deco’s Eyeshadow Base, simply as it’s cheaper. A little of this Primer Potion goes a long way (you need approximately 2 drops the size of a pin head for each eye). Unfortunately you can’t buy this in NZ, so it’s off to Beauty Bay if you are interested. For the quality of the product I reckon it’s bloody good bang for buck at AUD$29. Clarins Natural Light Lip Perfector 01: This gem of a product is half lip balm and half lip gloss/tint. I’m on my third tube. This is super nourishing with a sheer colour and adds a lovely shine to the lips. This is one of my favourite ever beauty products, a big claim, I know! There’s a bunch of different colours available, I’m boring, I stick to colour 01, a neutral soft pink that suits everyone. I know this as this is what I buy for my friends as super special presents (they love it too). Available at Farmers or pharmacies selling Clarins. Urban Decay 24/7 Glide on Liner ‘Perversion’: These waterproof eyeliners from Urban Decay come in a bunch of beautiful colours and I recommend these if you struggle with keeping your eyeliner on (i.e. It budges and smudges). I only have one, Perversion, which is an intense black. It’s so full on I only use it in one place: On my upper waterline to ‘tightline’ every day. This creates thick and dramatic looking eyelashes, without even touching your eyelashes! It’s totally waterproof and does NOT move. Incredible. I’ll be on my third pencil soon. Available from Beauty Bay (free shipping to NZ). Again, good value for AUD$28.50 when you consider this is what you’ll pay retail in NZ for a non-high end brand eyeliner! Maybelline The Falsies: I personally HATE the phrase ‘it’s my holy grail’ (in relation to a fan-dangle must-have product: Beauty bloggers seem to mutter this phrase every five minutes). However, if I did have a ‘HG’ mascara, it’s this one. It volumises, lengthens, separates, literally like you have false eyelashes on. Tip: There’s lots of different versions of The Falsies: Get ‘Everlasting’ – I find the version Black Drama smudges a little (we can’t have that). Available from New World, Countdown, Farmers, Kmart and pharmacies selling Maybelline. Neutrogena Oil-Free Makeup Remover: Another cheapie, but a goodie. I only use this in the morning to remove any makeup residue I didn’t quite get off the night before with my Clinique Take the Day Off Balm, or on makeup jobs. Nevertheless this product removes all eye makeup with relative ease, including waterproof eyeliner and mascara. Nice. Clinique All About Eyes: I’ve just realised I’ve been using this for about 10 years: Clearly I rate it! I use this every morning and I find this reduces any puff and helps with keeping fine lines at bay (as much as you can when you are an ant’s testicle off turning 40). Incidentally, I’ve noticed my under eye area is more puffy if I’ve had a particularly salty dinner the night before… Interesting – and unfortunate: I like my food super well seasoned… Available from Farmers or pharmacies stocking Clinique. Note: I actually use a different eye cream at night, which is ‘The Max’ from Image Skincare (I bought this from Simply Indulgent in Taradale: Image Skincare is a licensed beautician only range). This is an ‘industrial strength’ (my words, not in their marketing literature) eye cream and this is definitely halting, if not winding back the clock a little, happy days. Check out ‘The Max’ here. So, what beauty products do you buy time and time again? Let me know!